Building on the proven benefits of the BRS system, the two companies will apply techniques pioneered by automotive manufacturers that have cut injury rates in half since 1985. Impact energy, already tremendously reduced via parachute descent, will be further absorbed and dissipated through the integrated use of frangible aircraft structure, safely deforming seat supports, and airbags. SOUTH SAINT PAUL, Minn. & BOSTON -- (BUSINESS WIRE) -- BRS Aerospace, the leading whole aircraft rescue parachute system manufacturer in the world, and Transcend Air Corporation, developer of the Vy 400, a six-seat, vertical take-off and landing (VTOL) aircraft, today announced a partnership to make the Vy the safest VTOL aircraft in history. "BRS Aerospace is committed to continually advancing the cause of aircraft occupant safety," said BRS Fernando de Caralt, CEO of BRS Aerospace. "We look forward to working with Transcend to create one of the first aircraft to integrate our proven whole-airframe parachute system with today's technological advancements in automotive industry occupant protection." "BRS was one of the very first companies we approached when doing the initial conceptual design of the Vy 400," said Gregory Bruell, Chief Executive Officer of Transcend Air. "We are committed to making the Vy family as safe as possible, so this collaboration means not just installing a BRS parachute but driving the whole design from an occupant protection standpoint." 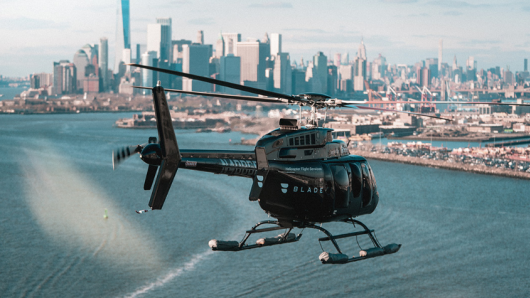 Why it’s important: By providing a world-renowned safety system to passengers aboard the Vy 400, Transcend Air is improving the public sentiment toward urban air mobility. The confidence that passengers will safely arrive to their location – whether it be for business or personal travel – is paramount, and the BRS parachute system will set a new standard for safety in the urban aviation industry. The Transcend Air Vy 400 is a VTOL aircraft with dual-propellors that rotate from the configuration of a helicopter to that of a propellor aircraft. Its propulsion systems allows the vehicle to have the VTOL characteristics of a helicopter, but fly at up to 405 mph in horizontal flight. Transcend Air plans to use their technology to transport business travelers between major cities, first launching the service in 2024 between Boston and New York City. Transcend Air is partnering with BRS Aerospace for Vy 400’s safety system. BRS is the leading whole aircraft rescue parachute system manufacturer in the world. The company has an impeccable reputation, and recently recorded its 401st life saved when the system was deployed. BRS has previously partnered with manufacturers of “Light Sport Aircraft, experimental aircraft, ultralights, unmanned vehicles, military aircraft, and FAA/EASA Type Certified general aviation, including the most popular piston-powered aircraft in production today.” This partnership with Transcend Air is supposed to make the Vy 400 the “safest VTOL aircraft in history”. Transcend is committed to designing the aircraft with occupant protection as the very first priority, and is expected to even go “beyond the occupant protection requirements of the current Part 23, Part 25 and Part 27 FAA aircraft certification regulations,” according to a press release. Upon activation of the system, a ballistic rocket propels a parachute into the airstream to slow the airplane and float it down into a survivable vertical landing. While currently designed for fixed-wing aircraft, BRS plans to slightly modify the system to accommodate the Vy 400. This includes the functionality for an automatic activation system. In addition to the BRS system, Transcend Air plans to implement new impact energy absorption techniques from the automotive industry such as state-of-the-art airbags and a frangible structure. BRS Aerospace (BRS), a whole aircraft rescue parachute system manufacturer, and Transcend Air Corporation (Transcend Air) — developer of the Vy 400, a six-seat, vertical take-off and landing (VTOL) aircraft — announced a partnership to make the Vy the safest VTOL aircraft in history. Transcend Air and BRS expect to go beyond the occupant protection requirements of the current Part 23, Part 25 and Part 27 Federal Aviation Administration (FAA) aircraft certification regulations. Building on the proven benefits of the BRS system, the two companies will apply techniques pioneered by automotive manufacturers that have cut injury rates in half since 1985. The impact energy — already tremendously reduced via parachute descent — will be further absorbed and dissipated through the integrated use of frangible aircraft structure, safely deforming seat supports, and airbags. BRS’ current whole aircraft parachute system for fixed-wing aircraft design calls for a parachute ballistic launcher to be installed in the aircraft with either a pilot-initiated activator located in the cockpit or an automated activation system. Upon activation, a ballistic rocket propels a parachute into the airstream to slow the airplane and float it down into a survivable vertical landing. Firms like Transcend Air, Boeing, and Airbus are building drone-based air taxis for short flights that can take passengers from city centers to major airports in minutes. London and Miami developers are already on luxury high-rises in anticipation of air taxi and drone services. Five years ago in a 60 Minutes interview, Amazon founder and CEO Jeff Bezos predicted that drones would deliver goods to American homes by 2019. As far off as that day still seems, we may not be waiting much longer. Currently, U.S. drones must be within eyesight of a “pilot” on the ground, but a new Federal Aviation Administration proposal would allow remotely operated flights. A Trump administration priority, new, liberalized drone rules will likely come out later this year. This, in turn, could spur an influx of drones delivering food, medical supplies, or other goods — and eventually “air taxi” drones carrying people — over cities. In fact, the U.S. government, governments abroad, and aerospace and tech companies are making very real preparations for a transportation revolution in the air, complete with a potentially enormous economic boost — and new challenges for states and localities. Some states are more ready than others, thanks to airplane laws passed decades ago. Emerging aerial technologies are already starting to play a much larger role in our daily lives. More than a million Americans own personal drones these days. Some are used for commercial operation, such as filming, inspecting rooftop property damage, or checking cellphone towers. A company in Iceland is making food deliveries via drone, while UberEatsplans to integrate the use of food delivery drones by 2021. But first, we need to adapt. One problem for drone operators is the threat of trespass lawsuits. Technologists and federal aviation regulators will be watching this case and others like it closely. If drone operators can be sued for trespass every time they fly over private property in certain states, the threat of litigation and legal costs could easily dissuade drone and air taxi companies from getting off the ground. Some state lawmakers who wish to encourage innovation while still protecting landowners have a solution handy. Currently, 23 states have what’s called a “navigational easement” law. These laws were passed beginning in the 1920s to protect early airplane pilots from most trespass lawsuits when they flew overhead. Wisconsin’s version of the law, which is fairly typical, protects aircraft operators from lawsuits “unless at such a low altitude as to intentionally interfere with” the use of the land. These laws probably don’t need to be changed to cover drones. Drones fly lower than airplanes but are also much quieter and less disruptive. Even in their current form, easement should protect a drone operator from being dragged into court unless a property owner can show some evidence of real disruption or a violation of privacy laws. States that have navigational easement laws, including New Jersey, California, and Maryland, will likely face fewer legal issues as commercial drones take to the air, making them more appealing for the next wave of innovation. States that don’t have them, such as Pennsylvania, Ohio, and New York, soon might wish they did. 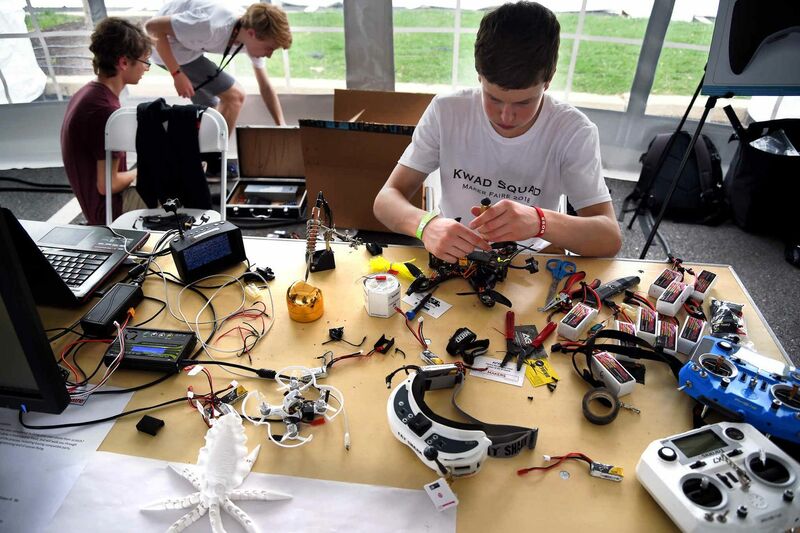 Innovation and technology policy is more important than ever in our states and cities. It’s moving beyond internet-based services and into health-care, transportation, retail, and labor markets, thanks to such tech as autonomous vehicles, telemedicine, and ride sharing. But technological progress is not an immutable fact of nature. Public policy can either inhibit or encourage it — and states need to decide which one they want to do. Brent Skorup is a senior research fellow and Trace Mitchell is a research assistant with the Mercatus Center at George Mason University. Building on the benefits of the BRS system, the two companies will apply techniques pioneered by car makers that have halved collision injury rates since 1985. SOUTH SAINT PAUL, Minn. & BOSTON--(BUSINESS WIRE)--BRS Aerospace, the leading whole aircraft rescue parachute system manufacturer in the world, and Transcend Air Corporation, developer of the Vy 400, a six-seat, vertical take-off and landing (VTOL) aircraft, today announced a partnership to make the Vy the safest VTOL aircraft in history. VerdeGo Aero™ has announced they are partnering with Transcend Air to apply VerdeGo’s IDEP™ systems to future versions of Transcend’s Vy 400 aircraft. This will allow Transcend Air to take advantage of developing electric power options, while also benefiting from already-available, traditional turbine power plants. VerdeGo Aero™ is going to change not just the way we fly, but the way we move around. After the decision to fully focus on propulsion systems, specifically building IDEP™ – (Integrated Distributed Electric Propulsion) a modular set of battery-electric and hybrid-electric propulsion components that are under development to support a wide array of VTOL aircraft and mission profiles – , VerdeGo Aero™ has recently signed three very interesting partnerships. 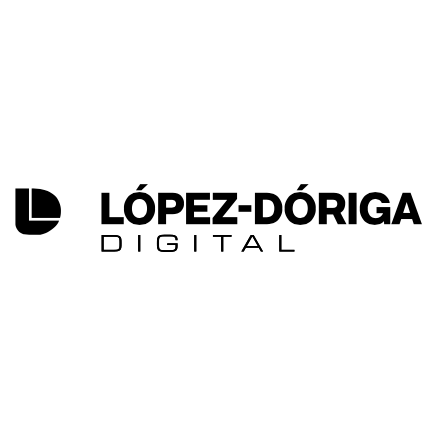 Those will enable the company to keep growing in the next couple of years and this also proves that the strategy to focus on IDEP™ propulsion system has put the company on the fast track to success. Leveraging VerdeGo’s IDEP™ with the Transcend Vy aircraft design will enable a new family of aircraft that deliver a variety of mission capabilities, with increased efficiency and sustainability. “VerdeGo Aero’s IDEP™ systems enable forward-thinking aircraft manufacturers such as Transcend Air to apply electric propulsion options to high-performance VTOL aircraft. Transcend Air’s adoption of our first-generation hybrid IDEP™ platform will smooth the path to a fully battery electric VTOL solution, once those options become viable,” said Eric Bartsch, Chief Operating Officer of VerdeGo Aero™. VerdeGo Aero™ has also announced a partnership with Seyer Industries to build a world-class supply chain to manufacture VerdeGo’s IDEP (Integrated Distributed Electric Propulsion) hybrid-electric powertrain systems for the next generation of Vertical Takeoff and Landing (VTOL) aircraft. 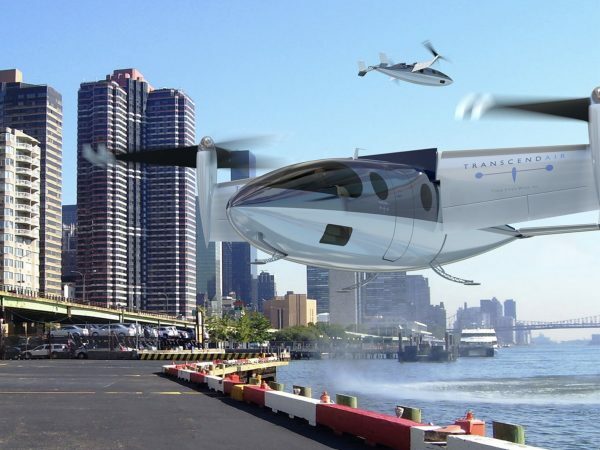 A global fleet of more than 100,000 of these next-generation VTOL aircraft is forecasted to be produced over the next twenty years as the Urban Air Mobility market grows. This strategic partnership includes financial investment by Seyer in VerdeGo, and leverages Seyer’s aerospace manufacturing capabilities as a key element of VerdeGo’s supply chain. “The St Louis community was a key part of enabling both my grandfather’s historic flight, and my work with the XPrize foundation on private spaceflight. It is really special to be partnering with Seyer Industries to open up the next big leap in aviation – flying cars” said Erik Lindbergh, co-founder of VerdeGo Aero™. “Seyer Industries is a key strategic investor in VerdeGo’s $2.5M financing round we are building out now. Their financial investment, combined with long-term supply chain partnership and near term support for prototyping and R&D make Seyer an invaluable partner to VerdeGo’s commercialization roadmap for IDEP™ powertrain systems” said Eric Bartsch, Chief Operating Officer of VerdeGo Aero™. The common thread – innovative application of existing technologies. The transportation industry has been at a crossroads between convention and innovation for the last 10 years. In the next 10, we’ll complete the next biggest thing since the advent of the jet engine following World War II. Transportation, medicine, finance, and real estate: all industries that at one point or another undergo a transformation. While some of these periods of “redefinition” are slow, others are step function inputs of technological progress, scientific research, or novel approaches to best business practices. Fortunately, the key indicators for large changes (while uncommon in specific mechanism) share commonality among the environments which spark the cycle of rapid development. For aviation, there were two such sparks, arguably three: the Wright Brothers (powered flight), the jet engine (World War II), and spaceflight (The Cold War). Two of these three periods of innovation were bred from necessity, and the first from (arguably) desire for adventure and pursuit of overcoming adversity. While it may be easy to retroactively claim that two brothers yearned to fly in a powered machine, or that the fastest aircraft would win battles in war, or even that the first country in space could possibly end up controlling the world, it’s harder to pinpoint realtime the complex psychology of a herd mentality that has shifted far enough, for long enough, to initiative substantive change. One common thread today is the initiative for responsible development and management of the earth’s resources, while another is the idea of providing larger breadth in access to the benefits of transportation to the world. A third, and arguably most powerful motive, is the idea that we’ve spent long enough being complacent with increasingly smaller “advances” to our technology to such a point where an actual leap must be made. It was over 50 years ago that man landed on the moon using a computer with 2048 words of RAM. A normal laptop computer could have provided the necessary computing resources for 100’s of thousands of Apollo missions concurrently, and yet we haven’t returned. While the moon isn’t necessarily a good benchmark (there are other political and environmental factors at play) the idea that we haven’t accomplished something of the same magnitude in so long is reason enough to raise the question – when will we? The answer is simple: we’ve been doing so for the last 10 years. Fly Blade Air Taxis have taken advantage of some of the market that once flew on New York Airways, but on a more private and semi-private scale. UAM intends to democratize the availability of commercial eVTOL transport. It could be argued that Urban Aviation started in the early 1950’s with the advent of New York Airways, shuttling passengers to and from Manhattan regularly. Unfortunately, a crash in 1977 ended that airline, and widespread urban commercial aviation operations haven’t returned since. However, since 2009, a number of Urban Air Mobility companies have been working tirelessly to make the industry a reality. A lot has been learned since 1977, to the point where Morgan Stanley claims that by 2040, UAM will be a $1.5 trillion dollar industry. We’re much closer to 2040 than 1977, and the level of investment in the industry (over $1 billion USD in 2018 alone) is providing the resources for rapid growth. Distributed Hybrid Electric Propulsion – By taking advantage of distributed hybrid electric propulsion, the UAM industry can leverage gas turbine strengths while also realizing the benefits of reduced energy requirements during the cruise and descent phases of flight. Smart Avionics – While there’s a large push for complete autonomous operation of urban aircraft (and in many cases the technology will be installed on urban aircraft to support complete autonomous operations) the initial commercial operation of UAM will not be autonomous. Public sentiment and regulatory requirements mean that autonomous operations aren’t necessarily ready today – not for the sake of technological readiness, but rather for societal readiness. Flight Testing & Certification Processes – for a number of OEM’s, the flight testing and certification process is already well underway. The dialogues that occur during 2019, and the resulting certification paths forward from these relationships between OEMs and regulatory agencies will define future, steady state interactions for the current group of earlier-stage urban aviation OEM’s. Composite Manufacturing – Composite manufacturing is difficult at small-scale, and even harder at large scale. Innovative techniques for manufacturing composites at scale will prove to be some of the highest value-add propositions that the UAM industry may lend to the rest of industrials. Low-Altitude Airspace Management – UTM technology is another watch item for 2019. The application of UTM technology in the US and globally is spreading quickly. Hear Ben Marcus, Chairman and Co-Founder of AirMap, the world’s leading low-altitude airspace management platform, explain how. Battery Technology – Why wouldn’t a Tesla battery work for an air taxi? TransportUP explained why in this article. (The TL;DR version is that we haven’t achieved the necessary energy densities required for revenue-generating commercial operations yet, and the rate of progress is pretty slow). If the “secret sauce” of increased battery energy is discovered, expect things to pick up, very rapidly. Why it’s important: The common thread – innovative application of existing technologies. Besides brand new battery technology, most of the watch items listed for 2019 have existed for some time – but what hasn’t is the combination of all of them on the same system. A number of moving parts must perfectly sync for UAM to realize commercial usage in 2023, but we made the moon in ’69 with that 2048 word RAM guidance computer. The odds look good for UAM. Want to learn more about urban aviation? Subscribe to our Urban Aviation Newsletter and our urban aviation podcast on iTunes to learn about how the leaders in the UAM industry are developing their technology in 2019. Transcend Air has the same idea. Though it’s not backed by an airline innovation lab, it’s focusing on ultra-short-haul flights between major markets with its four- and five-passenger VTOL planes. They’re testing aircraft now but expect to be flying commercially by 2024. Facial scanning, by-the-hour flight pricing, and flying cars from aviation-led venture capital groups. Buy ticket, get on plane, try (and fail) to sleep, land: The basic nuts and bolts of flying haven’t changed since the advent of aviation. But this year, thanks to a handful of aviation-led venture capital groups, the finer points are evolving. Last November, Air France and KLM announced Big Blank, an incubation studio that will identify tech-oriented growth opportunities for a network of five European carriers. 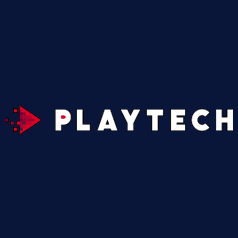 IAG, the parent company of British Airways, Iberia, Vueling, and Aer Lingus, also hosts regular pitch days for startup entrepreneurs through its accelerator, Hangar 51. “Travel is the fourth-largest industry globally, according to GDP, and when you see the dollars being invested into it, there’s a complete mismatch,” says Christina Heggie, investment principal at the three-year-old JetBlue outfit. The group’s projects are now coming to market faster than ever, thanks to a growing network of airline affiliates that are willing to beta-test them. “We may not go out and introduce you to our U.S. competition, but we’ll absolutely facilitate conversations with our international partners, like Air New Zealand,” she says. Here are seven projects these travel trailblazers are prioritizing in 2019—and what they mean for you. 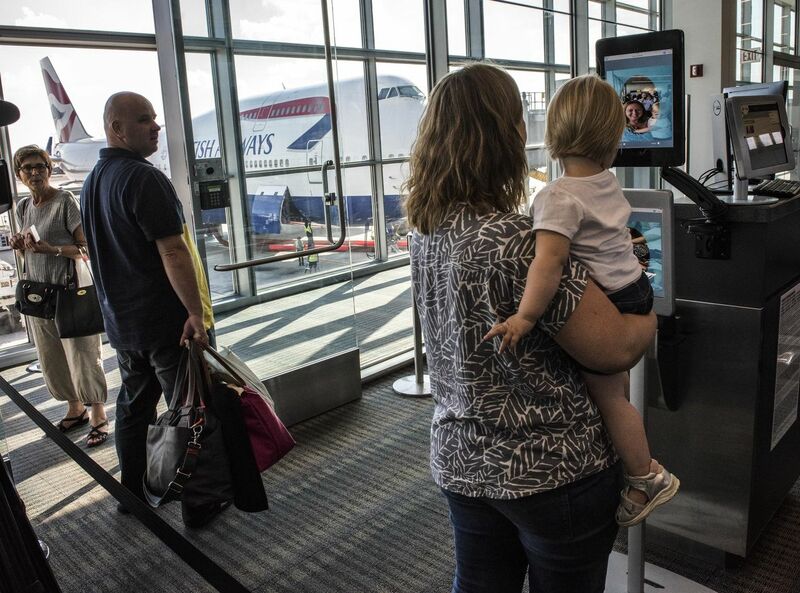 British Airways is currently installing facial detectors in front of boarding gates at New York’s John F. Kennedy International Airport following successful tests with domestic travelers at Heathrow and subsets of international travelers in Los Angeles and Orlando. Other hubs are expected to follow. How it works: Rather than show your boarding pass or passport, you’ll simply walk past a camera that can match your likeness to images that U.S. Customs and Border Protection already have on file from previous scans of your hard-copy ID. In a split second, your identity is verified, opening an automated gate and letting you proceed to boarding. “We’re ready for any airport in the U.S. to tell us they want to install this,” says Raoul Cooper, British Airways’ senior design manager, who focuses on digital airport innovation. “Then we can extend it to any part of the airport that requires identity verification or uses kiosks—maybe even outside the airport, in places like banks,” he says, adding that the only hitch is making sure the cameras can recognize you under the big-eared Mickey Mouse hat you bought on vacation. An early type of face-scanning technology being prototyped at Dulles International Airport. Lufthansa’s Tritus sees the biggest game-changing potential in a company called Yilu, which aggregates all your travel reservations (e.g., OpenTable, your car transfer company, and Marriott) into a single system; think TripIt but broader. “We’re trying to interlink existing services that don’t normally cooperate with one another,” he explains, “which would allow us to modify your airport pickup time, rebook your dinner reservations, or update your hotel’s check-in desk automatically in the event of a flight delay or cancellation.” Expect to see a limited functionality in Germany this year, ahead of a global rollout. Google has done an especially good job of predicting travel delays, but JetBlue Technology Ventures wants to one-up its competition. With Lumo, it’s building statistical models that simulate the conditions of your flight. It’s so granular, it’ll consider both the density of planes in your airspace and how the Federal Aviation Administration has previously made decisions in similar weather forecasts. All this gets converted into a rating score, offering up a real-time sense of how likely you are to encounter a delay. “This is huge if you’re traveling to pitch a multimillion-dollar client,” says Heggie, adding that the app will show you alternate (and on-time) routes if you need to rebook. JetBlue Technology Ventures doesn’t want you to wait until you see this to know that your flight is delayed. Meanwhile, Lufthansa is betting you’ll want to buy flights in bulk with Flightpass; it lets you buy 10 unrestricted, one-way tickets for a flat fee that starts at €500 ($570). The service will kick off long-term implementation with carriers, including Swiss and Eurowings, this year; similar offerings are already in use by Air Canada and British Airways. “We’re trying to figure out how to price it to be profitable,” says Tritus. “The highly regulated environment of an airport is perfect for automated vehicles,” says British Airways’ Cooper. Today, your luggage gets offloaded from a plane onto a trolley, driven to a series of conveyor belts, and routed around the bowels of the airport until it lands on the rotating baggage carousel. “But what if your bag could be taken straight to the right place by an automated set of wheels? It would reduce cost, create efficiency, and get you your bags much faster, benefiting the customer in the end.” Expect it to be trialed in the U.K. later this year. 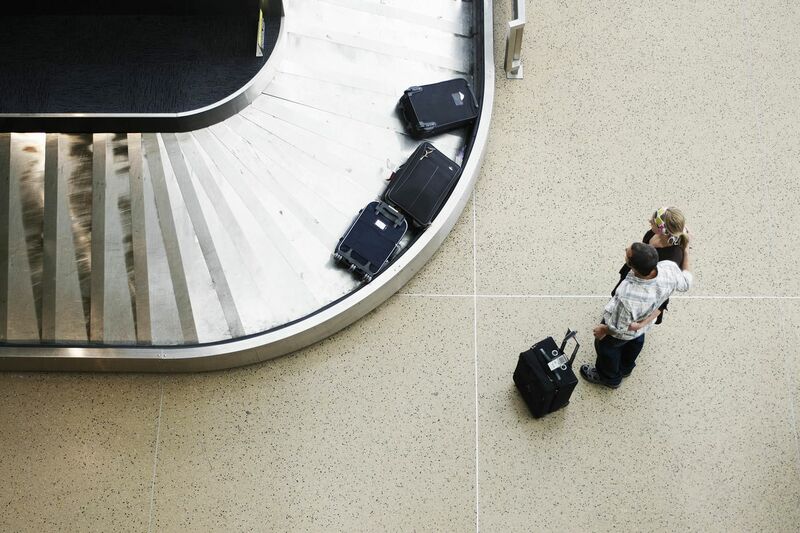 The Linea app will soon digitize the customer service process for lost luggage. Engineers Greg Bruell and Peter Schmidt, founders of Transcend Air, are hoping their five-passenger drone aircraft capable of landing anywhere will eventually make air travel faster and easier from city to city. TODAY’s Dylan Dreyer reports. Fortunately a number of aviation companies, ranging from established OEMs to innovative start-ups, are working to make the long-held fantasy of “flying over the traffic” an affordable reality – with the emphasis on “affordable.” Enter the “VTOL”: Vertical Takeoff and Landing Aircraft that are fast, efficient, and almost ready for market. For all the ease offered by business aircraft travel, one frustrating and pedestrian problem remains. You still have to get to the airport. Depending on your location, that could mean a trip longer than your flight. According to a recent study by the analytics firm INRIX, Los Angeles and New York are the two U.S. cities with the worst traffic in the nation. Moscow, São Paulo, London, and Paris are in the world’s top ten. In fact, according to a United Nations study, by mid-century there will be 9.7 billion people in the world, 70 percent of whom will live in cities. During the same period, the global economy is expected to triple in size, likely doubling road and rail travel, according to the Organization for Economic Co-operation and Development. This study reports that, on average, Americans spend 91 hours a year looking at other cars in front of us. With infrastructure problems, roads clogged with more cars and ride-sharing companies, we seem to be destined to slog it on the ground for a long time to come. Travel to and from the airport to board your business jet will only get tougher. While helicopter service long has been available from major urban centers, helicopters are expensive, slow, and have a questionable environmental footprint. Military jet VTOLs, capable of ascending straight up from aircraft carriers and limited ground landing areas before converting to horizontal flight, have been in service for decades. The civilian VTOLs currently under development will offer the same vertical takeoff capability, with horizontal cruise speeds and passenger cabin configuration, size, and comfort, comparable to light business jets. Since VTOLs do not have to operate from airports, no new concrete needs to be poured. They can operate from already available heliports or from new landing spots that take up only a few hundred square feet, like an office parking lot or open field. The VTOL offers business jet owners and users accessibility to fast and efficient air transportation between and among urban and suburban population centers, with the comfort and convenience of a limousine. You’ve likely heard claims that all-electric, autonomous robot VTOLs will provide lift across major cities. But batteries today are not powerful and light enough, so the likelihood of public and government acceptance of pilot-less electric flying machines is a long way off. VTOLs with jet engines or hybrid-electric powerplants, with human pilots at the controls, will rule in the near- and mid-terms. 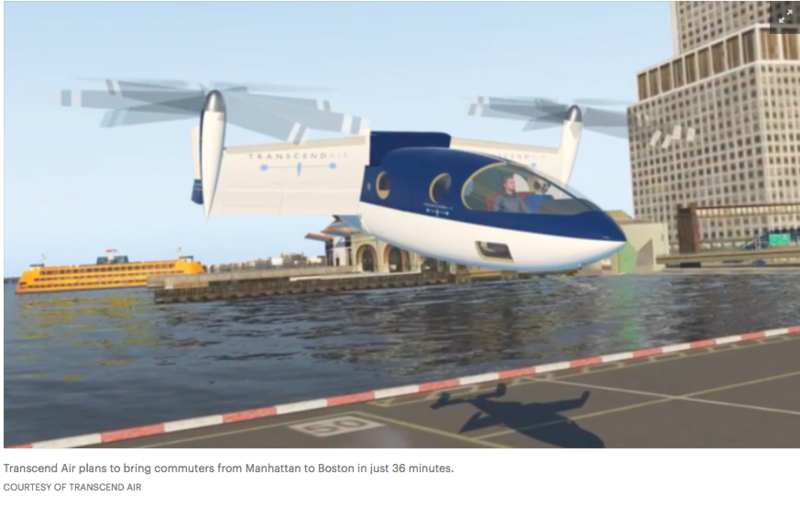 VTOL fleet operators plan to establish midtown to midtown commuter airline-type service between city pairs like Boston/New York and San Francisco/Los Angeles by early 2024, for a projected cost of approximately $300. You’ll be able to charter a VTOL to avoid ground traffic snarls and add productive hours to your workdays. For added privacy and security, you’ll be able to purchase a VTOL for your own use. Transcend Air’s Vy 400 is the modern reimagining of a fifty-year-old concept: the vertical take-off and landing (VTOL) aircraft. Its lightweight carbon-fiber construction will lower operating costs and enhance safety, and it features new advanced avionics and a safety-certified whole-aircraft parachute. The Vy’s tiltwing, fly-by-wire VTOL design makes it three times faster than traditional helicopters, and promises travelers a more affordable and convenient service than conventional airplanes. Transcend will also launch a new, door-to-door airline service that will transport business travelers between major city centers without the need for airports. We asked Greg Bruell, co-founder and CEO of Transcend, to talk to us about the exciting technology behind the Vy 400. My background is in software, and I’ve been involved in startups either as an early member or as a founder for my entire career. About 6 years ago, I had been doing what I considered fairly run-of-the-mill software and I decided to mix it up. I’d always been interested in planes that took off like helicopters—ever since an early 90s edition of Popular Science featured the Moller M400 on the front cover. Then I found a fellow who had been working on an aircraft. He’d been building models and had a good-looking design, so we decided to make a large, manned version of it, and that’s what we did with Elytron. We took that project as far as we could at the time, but we needed to find a market for an aircraft like that—a small aircraft that took off like a helicopter—and that’s when I landed on the air taxi idea and what became Transcend. Coming from software, what challenges did you face starting the Transcend project? There’s always a challenge in building something, regardless of whether it’s software or hardware. Even though I’m building an airplane now, the fact is that there’s tons of software involved. The biggest leap professionally from the software world into aerospace would have to be the concept of tolerances. We built the gearboxes for our manned aircraft at Elytron and the 2 months we had budgeted for ended up taking 8 months—just because of tolerance issues. The biggest learning curve for me was to always have to be thinking about tolerances as I design or order a part. The wing on our current 1:5 scale prototype, for instance, is a combination of stock carbon fiber parts wrapped in 3D-printed nylon. Learning about the variances that you get with 3D printing and how to accommodate for that and getting those things to behave in a consistent way has been excellent experience. Since 2009, Transcend has built and flown 15 prototype VTOL aircraft. Could you tell me about the evolution of Vy’s prototypes? The first full Vy 400 prototype was a scale model made with standard RC modelling techniques, made from hotwired styrofoam with carbon fiber spars and balsa wood. We had a lot of problems with vibration though, and it was fairly flimsy, with some crashes and significant rebuilds. With the next version, we made use of quadcopter technology and we went from using helicopter hubs and a collective control to just using motor speed and off-the-shelf, high-end quadcopter motors. The other big evolution in the design was that we actually made a plug and a mold for carbon fiber skins. The big difference with where we’re at now is having the carbon fiber shells. All of the main structural elements are off-the-shelf carbon fiber tubing, with some stock tubing for landing skids and what we call the “keel” of the aircraft. The spars in the wings are also off-the-shelf carbon fiber, while all of the lifting surfaces and the mountings—all the internal mounting bits for electronics and batteries and such—are 3D-printed. 3D printing has given us a rapid recovery capability, so when you crash a prototype—and you always crash one at the RC scale—you don’t have to spend long rebuilding. The recovery process is “hit print and get a part in the mail.” It also means we can keep spares around instead of building them on demand. The VTOL concept itself has been around for some time. How has the Vy 400 updated it? It most closely resembles Canadair’s CL-84, which first flew in the mid- '60s. The lineage for us, though, is that we vector the thrust—that is, change the direction of the thrust during flight—by tilting the whole wing. It’s a tiltwing-derived design. The other main thread of vectored thrust that’s out there is the tiltrotor, where just the base of the prop rotors on the aircraft are tilted. The Osprey MV-22 and the Leonardo 609 are examples of aircraft from that lineage. Arthur Young, who ended up working for Bell Helicopters, had patents which go back to the '40s covering much of the major design elements. When you do a tiltwing design, you want to have as much rigidity as possible spanning the entire wing. He came out with a patent for a design where you have this cutout and you’re able to maintain a single leading edge spar for the whole wing, and that design is still the best way to do it. However, we get to take advantage of all of the material updates since then—carbon fiber especially—so things like driveshafts are much lighter. All of the power-to-weight ratios for the engines have improved over the years, so in some cases we’ve got twice the horsepower for the same weight. The BRS Airframe Parachute allows us to have a single engine, and that radically changes the design requirements. We have this ability to recover in an emergency—whether it’s engine failure or anything else—that Cirrus first brought to market in the early 2000s, and has proven effective in keeping people safe. All of those innovations have permeated the design of the Vy 400. Why not use batteries instead of a jet engine? You can’t do a city-to-city flight economically with batteries—the energy density just isn’t there yet. Jet fuel is one of the most efficient ways of carrying around energy you can get without going nuclear. I like to talk about our design as being fairly conservative, which is to say that we’ve tried to pick up as many certified, off-the-shelf parts we can, so only the VTOL piece of it is unique. I think we’ll get to market as quickly as possible and reduce our risk by picking up pieces and parts that are already certified and ready to go. If you look at the very light jet market from about 10–15 years ago, the leader of which was Eclipse, they tried to introduce a lot of new technologies all at once and that made their certification process and their schedule balloon out. Similarly, our eVTOL (Electronic Vertical Take-Off and Landing) brethren have a much higher hill to climb, and they will have a lot more to prove to the FAA than we will. Right now, we’re proving the basics of the design: we fly models and we go into the wind tunnel. That’s all meant to demonstrate what’s called a T-Pattern flight at the fifth scale: take off like a helicopter and convert to a plane, fly like a plane, then convert back to a helicopter and land. The next step is moving to the half scale, and then we’ll go for a full-scale concept. Coming from the software world, it’s interesting how systematically we have to go through this process of scaling up in order to make sure that the aerodynamics work and that as you make a larger and larger aircraft, that they continue to work. Here, you have to crawl before you can walk, and you have to walk before you can run. Want to learn more about Transcend? Or visit www.transcend.aero to learn more about their project. Amazon may be looking further down the road to the maturation of a wave of electric and hybrid aircraft under development that could enable cheaper, quieter air travel within and between cities for more employees than just its founder and top executives. 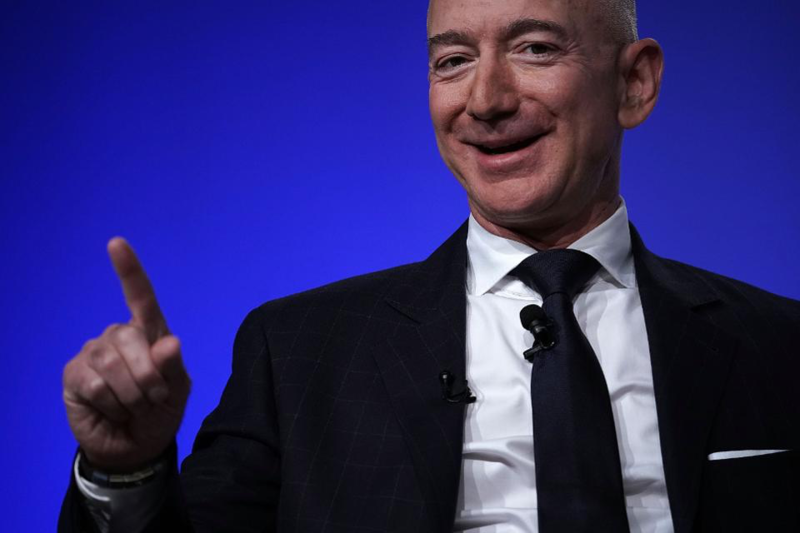 “Jeff Bezos has his own spacecraft company — of course he’s thinking about the future of aerospace and transportation,” says Peter Schmidt, a former private jet charter executive who’s cofounder of Transcend Air. Amazon has come in for a roasting over clauses in its agreements with New York and Virginia authorities promising the e-commerce giant private helipads at the two huge office complexes it’s planning to build. The New York tabloid takeaway: politicians are treating billionaire Jeff Bezos to a quick and easy air commute courtesy of taxpayer subsidies while we rattle around on a decrepit subway system. There’s likely more to it. Amazon may be looking further down the road to the maturation of a wave of electric and hybrid aircraft under development that could enable cheaper, quieter air travel within and between cities for more employees than just its founder and top executives. And the location of its planned campuses — by the East River in the Queens neighborhood of Long Island City, and close to the Potomac in Northern Virginia — will give it access to waterways that currently serve as flight corridors, so the company doesn’t have to wait for the uncertain prospect of regulatory approval for the more widespread, over rooftop flying that Uber Elevate’s vision of the future will require. “Jeff Bezos has his own spacecraft company — of course he’s thinking about the future of aerospace and transportation,” says Peter Schmidt, a former private jet charter executive who’s cofounder of Transcend Air, a company that’s developing a six-passenger tilt-wing aircraft for inter-city transportation. Amazon declined requests to comment. VerdeGo Aero has announced that it is teaming with Transcend Air to apply VerdeGo’s IDEP (Integrated Distributed Electric Propulsion) systems to future versions of Transcend’s Vy 400 aircraft. This will allow Transcend Air to take advantage of developing electric power options, while also benefiting from already-available, traditional turbine power plants. 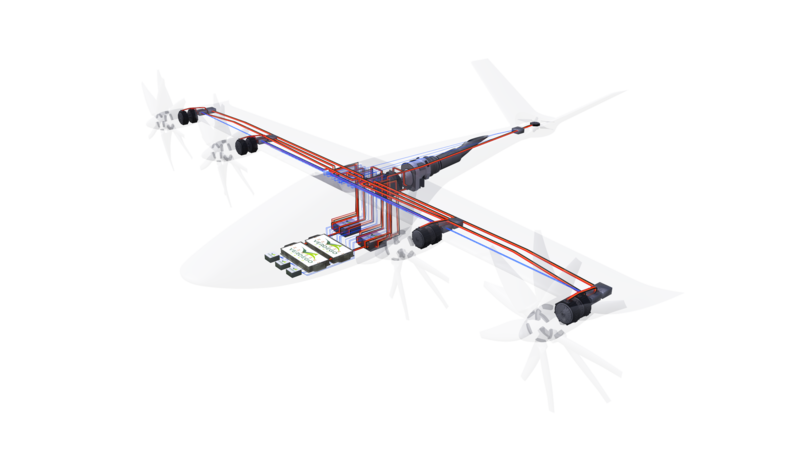 VerdeGo Aero’s IDEP systems are a modular set of battery-electric and hybrid-electric propulsion components that are under development to support a wide array of VTOL aircraft and mission profiles. 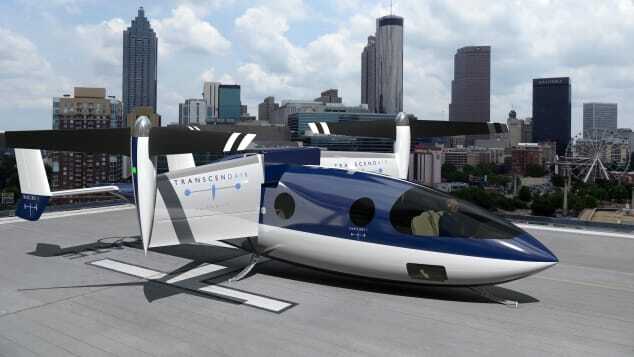 Transcend’s Vy 400 is a VTOL aircraft optimized for fast, inexpensive, city-to-city transportation. Fitting the Vy 400 with IDEP propulsion in the future will enable both increased efficiency and sustainability for the Vy aircraft family. “VerdeGo Aero’s IDEP systems enable forward-thinking aircraft manufacturers such as Transcend Air to apply electric propulsion options to high-performance VTOL aircraft. Transcend Air’s adoption of our first generation hybrid IDEP platform will smooth the path to a fully battery electric VTOL solution, once those options become viable,” said Eric Bartsch, Chief Operating Officer of VerdeGo Aero. The first-generation hybrid IDEP systems currently under development at VerdeGo Aero can be applied to aircraft for Urban Air Mobility, cargo transportation, military missions, EMS, and longer-range VTOL missions. The hybrid IDEP platform is being engineered to enable seamless upgrades to the second-generation battery IDEP platform when battery cells with sufficient energy density, power density, cycle lifetime, and cost are available for aerospace usage. VerdeGo Aero was founded in 2017, by a world-class team with experience across multiple electric and hybrid-electric aerospace programs including: Erik Lindbergh, Dr. Pat Anderson, and Eric Bartsch, and is headquartered in the Research Park at the Daytona Beach campus of Embry-Riddle Aeronautical University. VerdeGo Aero is working with leading innovators around the world on propulsion options for VTOL aircraft aimed at a wide array of markets and missions, including a program with IAI (Israel Aerospace Industries) regarding the civilian Urban Air Mobility market. 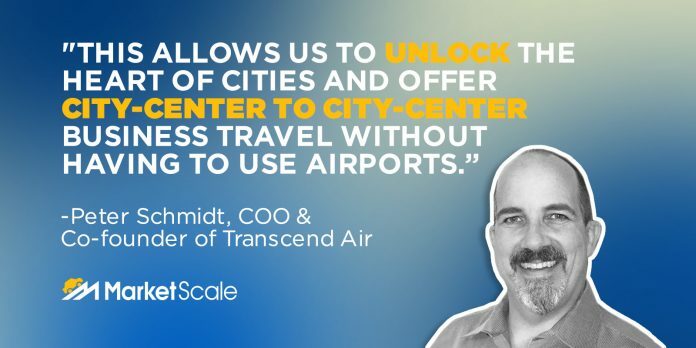 Transcend Air was founded in 2017 to unlock the heart of the city with a VTOL airline that will free business travelers from congestion on the ground and in the air. Having taken the unique path of designing an aircraft starting from a ticket price, Transcend Air has developed the Vy 400 as the best solution for city-center to city-center travel, with door-to-door prices lower than current air travel options, and door-to-door times that are 67% to 80% less. With the Vy 400, Transcend Air is finally realizing the VTOL promise. “We have designed an aircraft that takes off and lands like a helicopter, but flies fast in between like a jet,” Schmidt said. “That allows us to unlock the heart of cities and offer city center to city center business travel without having to use airports.” Schmidt breaks down and explains how he and his company found a way to get you from NYC to Boston in 36 minutes, and how he’s looking to transform our concept of air travel for good. We hear about why air travel has remained relatively stagnant, the obstacles with entering the aerospace landscape, and about Schmidt’s lifelong love of aerospace. Say goodbye to runways, too. Imagine boarding a plane at a local helipad, then taking off vertically from Boston and arriving in New York City 36 minutes later. Boston-based Transcend Air Corporation is working on an aircraft that will make such travel a reality. 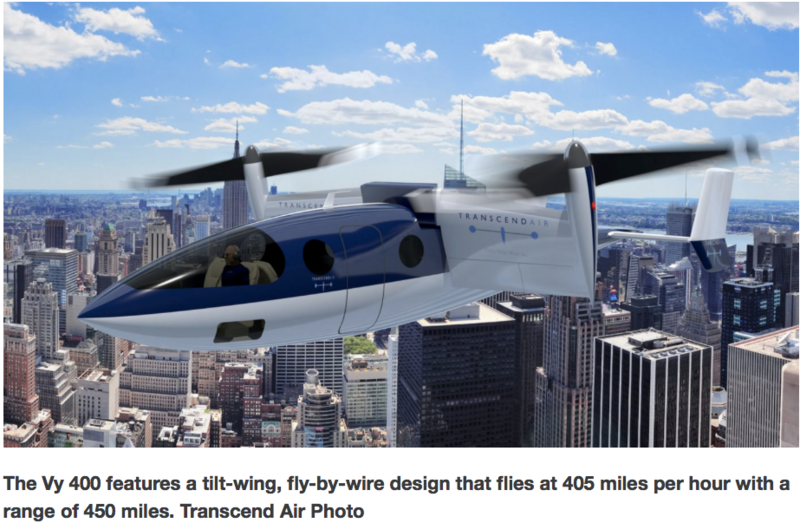 The company plans to launch the Vy 400, a vertical takeoff and landing aircraft (VTOL) in 2024, said Greg Bruell, CEO of Transcend Air. 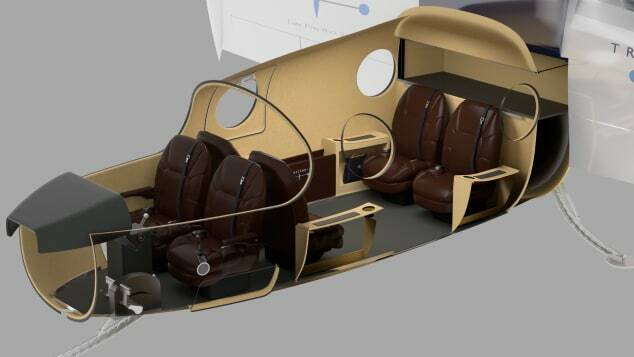 Bruell’s company is currently working on prototypes of the plane. “The neat thing about this aircraft is it combines the ability to take off like a helicopter with the ability to go really fast,” Bruell said. The Vy 400 will fly travelers to destinations within 450 miles at 405 miles per hour, which is three times faster than a helicopter travels, according to Bruell. The company is using proven technologies already on the market, such as a tilt-wing design that allows the aircraft to take off and land like a helicopter and a whole-aircraft parachute for safety. The plane’s vertical takeoff and landing means there will be no need for an airport or a runway. Bruell’s inspiration for the plane came from the fact that he works and lives in the Boston area and travels frequently to the New York City area to visit family. He said the trip has become more time consuming over the years due to congestion during the commute and at the airport. “We think what we’re going to be able to offer people is the best possible door-to-door times while maintaining a relatively competitive price,” Bruell said. The one-way flight between New York and Boston will cost $283, which Bruell said is competitive with one-way commercial flight prices between the two cities when tickets are booked within a six-day window typical of a business traveler. Travelers will board the aircraft on a helipad. Once on board, the experience will be similar to a commercial flight’s, but roomier, he said. The seats will be 23 inches wide, which is larger than typical seats on commercial airlines. The aircrafts will carry up to five passengers, along with a pilot. What you won’t find will be restrooms or flight attendants for the short trip, Bruell said. An aircraft the size of the Vy 400 is not required to have restrooms, according to Bruell, whose said his company has already started the certification process with the FAA. Bruell said the company wants to launch the service with a fleet of 10 aircraft in the Boston/New York market and grow from there. The company has also posted on its website plans to fly between Los Angeles and San Francisco, a 55-minute trip that will cost $315, and Montreal and Toronto, a 60-minute trip that will cost $325. Bruell’s team is currently eyeing 46 different routes it can service between cities across the U.S. He said his company will perform route tests between Boston and New York City in the next two years. Transcend Air wants to get business travellers directly to and from major cities with a new flying taxi service. The Boston-based aviation company is working on the prototype for a six-seater aircraft that will get commuters from New York to Boston (US$283 (€245) one-way) in 36 minutes, from Los Angeles to San Francisco (US$315 (€273) one-way) in 55 minutes and from Montreal to Toronto (US$325 (€282) one-way) in just one hour. Travelling from New York to Boston could take just 36 minutes thanks to a new aviation startup that wants to revolutionise the way we commute. Their six-seater vertical takeoff and landing (VTOL) aircraft flies like a jet but takes off and lands like a helicopter, meaning it can depart from almost anywhere. The aircraft features a tilt-wing, fly-by-wire design similar to the CL-84, created by Canadair in the 1960s. Seats will be comparable in size to most commercial airlines but there’ll be no restrooms to save on space. They’ll have a range of 450 miles, with speeds up to 405 miles per hour – three times faster than a helicopter. The company has already started the certification process with the Federal Aviation Administration and hopes to introduce the service in 2024. To find out more about Transcend Air, see here. Transcend Air is using technology to find efficiency in getting from point A to point B. Rather than going through a crowded airport with incredibly slow service, they want to have a flying taxi that skips the traffic and security checkpoints and just soars through the air until you reach your destination. 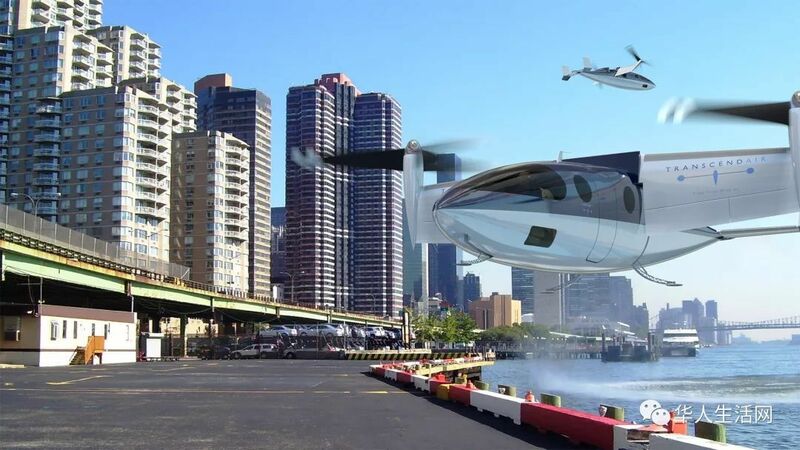 A new tech startup is promising to introduce a flying taxi service that will get you from New York City to Boston in just 36 minutes. The company is called Transcend Air, and they’re looking to revolutionize the way we get from city to city in North America. Most short-haul flights in the United States take only minutes of airtime, but it can take way longer when it comes to the whole process of checking into your flight, going through security checkpoints, waiting to board, and taxiing to the runway. If you add in the time it takes to actually drive to and from the airport, a simple trip from Boston to New York can easily take more than 3 hours even though the flight itself barely took 40 minutes. And let’s not even consider the horrors that await you during rush hour in either city. That 3-hour travel time can easily balloon up to 5 hours at the worst time of day. The plane itself is less revolutionary and more evolutionary. It’s a small, 6-seater, tilt-wing propeller plane that takes off and lands without the benefit of a runway. The technology was pioneered in the 1960s with the Canadair CL-84 but then shelved after two of the prototypes crashed due to mechanical failure. Flash forward half a century later, and Transcend thinks they’ve perfected the technology and are willing to make an economic go of it. The advantages to Transcend’s business model is clear: vastly less time spent waiting around, and a quick, easy flight to wherever you need to go. And owing to the vertical takeoff and landing properties of their prototype aircraft, you can technically land and take-off wherever you want. There are a few downsides, however. The plane is small, so there’s no bathroom (not that you’d need it on a 36-minute flight). Also, the pricing is at a premium for high-volume routes. So far, Transcend has NYC to Boston priced at $283, while San Francisco to LA is estimated to be $315. However, they do have several lower-volume city flights priced under $100. We’ll have to wait for Transcend to get closer to operational status before we know more. Right now they’re planning to open in 2024, but only if their aircraft receive FAA certification. We’ll have to endure the wait at the airport until then. A new airline service says it will revolutionize the way people travel. Transcend Air is promising commuters a quick and easy way to commute between cities for a fraction of the cost and time. For example, a trip between New York City to central Boston would cost $283 a ticket and last 36 minutes — with zero time at an airport. 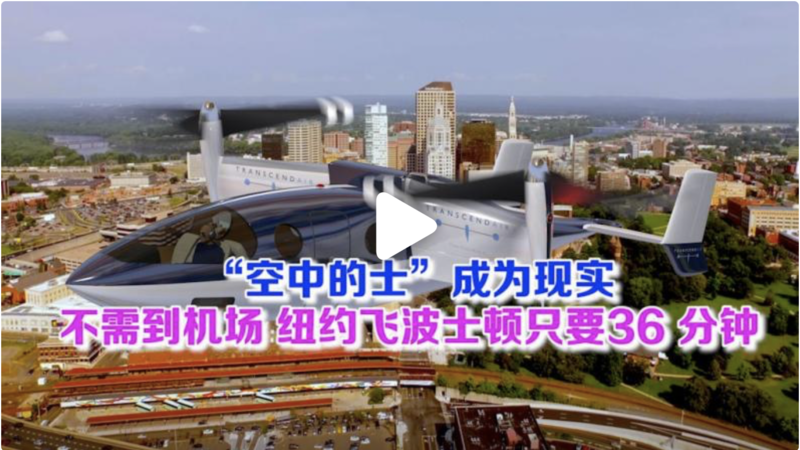 The Boston-based aviation company is developing a prototype six-seat aircraft that zooms through the air at up to 405 miles per hour and can take off like a helicopter, meaning it can depart from almost anywhere. Transcend says it could be in the air by 2024, according to a prepared statement from June. The development of the lightweight, carbon-fiber Vy 400 (Vy) — a six-seat, vertical take-off and landing (VTOL) aircraft — will deliver business travelers directly to and from major city centers. The Vy will provide faster, more affordable door-to-door service than either helicopters or conventional airplanes, without the need for airports. Transcend will deliver service right from major city centers, such as Manhattan and downtown Boston, using VTOL-ready landing pads. A trip between Los Angeles and San Francisco would cost $315 one-way and last roughy 55 minutes. The Vy features a tilt-wing, fly-by-wire design that flies at 405 miles per hour – three times faster than traditional helicopters – with a range of 450 miles. Transcend plans to launch commuter airline service in early 2024. The modern Vy is expected to come with low operating costs and enhanced safety, and features novel advanced avionics such as whole-aircraft parachute. Imagine walking off an airplane and right into your office. No sitting on the runway waiting for a gate to open before you can unbuckle, make a mad dash to grab your carry-on and then wait your turn to disembark. No breathless hustling through the airport's seemingly endless terminal before boarding a shuttle for ground transportation and finally flagging a taxi before the inevitable sitting-in-traffic portion of the journey. 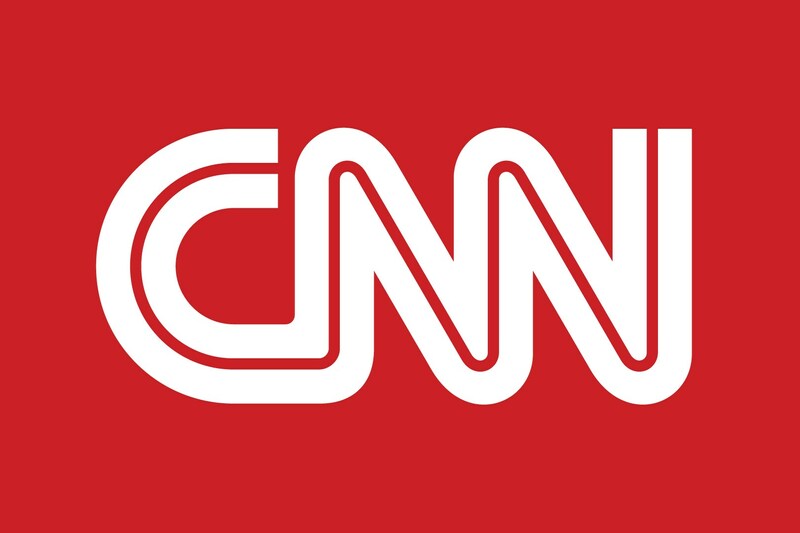 (CNN) — Imagine walking off an airplane and right into your office. No sitting on the runway waiting for a gate to open before you can unbuckle, make a mad dash to grab your carry-on and then wait your turn to disembark. No breathless hustling through the airport's seemingly endless terminal before boarding a shuttle for ground transportation and finally flagging a taxi before the inevitable sitting-in-traffic portion of the journey. Transcend Air wants to eliminate the most frustrating parts of air travel and get passengers where they're going in a record amount of time. Its aircrafts -- after six years of design refinement, they have 15 prototypes-- seat approximately six people and are structured around city-to-city flights that are as fast as jets. Transcend Air's aircrafts will utilize VTOL (Vertical and Takeoff Landing) technology and be as fast as jets. Peter Schmidt, COO of Transcend Air, entrepreneur and aerobatic pilot (he's skilled in doing all kinds of fun stuff in the air such as loops and rolls), says that the new airline is in the beginning stages of working with the FAA to meet the guidelines required to be a commercial airline. Meeting all of the safety requirements can take years, which is why 2024 is the projected launch date of Transcend Air. If all goes as planned, travelers will be able to get from NYC to Boston in 36 minutes, Los Angeles to San Francisco in 55 minutes and Toronto to Montreal in an hour. 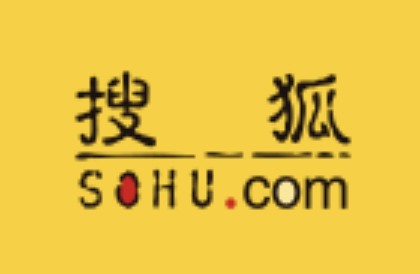 The company is currently eyeing 46 city center pairs in the US with plans to expand internationally. Schmidt says the company's vision is to come down over the water and build landing pads on barges or piers since a city's business center is often close to the water. Peter Schmidt, COO, says that the company's vision is to build landing pads on barges and piers — close to city business centers. Although the aircraft will have the feel of a private charter, it will cost a fraction of what typical private aviation costs. That NYC to Boston leg? Transcend Air anticipates charging just $283. There's no room for a flight attendant, but coffee will be offered pre-flight. "The secret," says Schmidt is "by servicing business travelers city to city, we can fill all those seats in both directions." There's no room for a flight attendant on board, so there won't be champagne or five-star service on these flights, but there will be coffee and cup holders and, most importantly, no airport necessary. If that isn't a selling point in and of itself, perhaps you haven't been to JFK in a while. Flight of Fancy: Is the future of air travel Boston to New York in 36 minutes? You’re usually looking at something like three hours to get from downtown Manhattan to the heart of Boston, Massachusetts. First, count on a half-hour cab journey to LaGuardia Airport. Then maybe an hour of security clearance and waiting to board. When you finally make it to the plane, you’ll spend 22 minutes taxiing out, 39 minutes in the air, and seven taxiing in. Ten to 15 minutes to get out of the airport (we’re assuming you didn’t check a bag), then another 10 to 15 minutes in a car downtown. Total journey time? About 182 minutes—assuming no delays, traffic jams or unforeseen circumstances. But it doesn’t have to be that way, says Boston-based aviation company Transcend Air. They promise a new six-seat aircraft that will take you from central Boston to New York City in 36 minutes flat—without ever needing to be within sight of an airport. The company believes it can fly get passengers from A to B in a fraction of the time of commercial planes—and for a comparable cost. But their figures seem a little off. That 36-minute flight between New York and Boston is currently set to cost $283—most one-way flights between the two cities clock come in at just under $100. And while a 55-minute journey between Los Angeles and San Francisco might be worth paying more for, the $315 Transcend quote seems steep compared to the current $120 plane journey, which takes about 100 minutes. But it’s not just about shaving off minutes in the air. Because, like a helicopter, the aircraft takes off and lands vertically, it can leave from anywhere, saving passengers the time it takes to get to the airport and taxi to runways. Seats will be comparable in size to most present-day commercial airlines—though there’ll be no restrooms, to save on space. Transcend Air says the initiative is “within reach,” on its website, aiming to launch service in 2024. But the company still has a way to go, including obtaining Federal Aviation Administration certification for the aircraft, which can take years. For now, the “Buy Now” button on their website is just for show—and that three-hour commitment to get from New York to Boston unlikely to change soon. 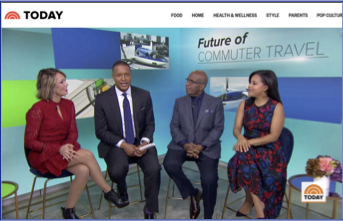 A private transportation company seeks to offer a new form of travel connecting Boston and New York in under an hour. Boston-based Transcend Air Corporation is developing the Vy 400, a six-seat, vertical take-off and landing aircraft. "It takes off and lands straight up and down," the company said of the aircraft's design. "This means we don't need runways and airports. We're able to depart and arrive right in major city centers." The company says the prototype can travel more than 400 miles per hour - three times faster than traditional helicopters - cost less to operate and offers a quieter ride than a helicopter. "The Vy will provide faster, more affordable door-to-door service than either helicopters or conventional airplanes, without the need for airports," the company said in a statement. "Transcend will deliver service right from major city centers, such as Manhattan and downtown Boston, using VTOL-ready landing pads." The company plans to launch commuter services between multiple North American cities in early 2024. Current planned services include: flights connecting New York City and Boston in as little as 36 minutes; Los Angeles and San Francisco in 55 minutes; and Montreal and Toronto in 25 minutes. Announced prices are comparable to commercial flights between cities: $283 to-and-from Boston; $315 for West Coast flights; and $325 for Canadian travel. Transcend Air says they hope to expand to dozens more cities in later years. Transcend Air is developing a turbine-powered, tiltwing VTOL for city-center to city-center travel. Betting that battery technology will not be adequate for decades, a group with experience in both vertical-takeoff-and-landing (VTOL) aircraft and air taxi operations has launched development of a turbine-powered tiltwing aircraft for intercity flights. Boston-based Transcend Air has unveiled the Vy 400, which is designed to carry a single pilot and 4-5 passengers up to 450 mi. at a cruise speed of 405 mph (350 kt). With a maximum takeoff weight of 6,990 lb., the aircraft is powered by a single 1,700-shp Pratt & Whitney Canada PT6 turboshaft. 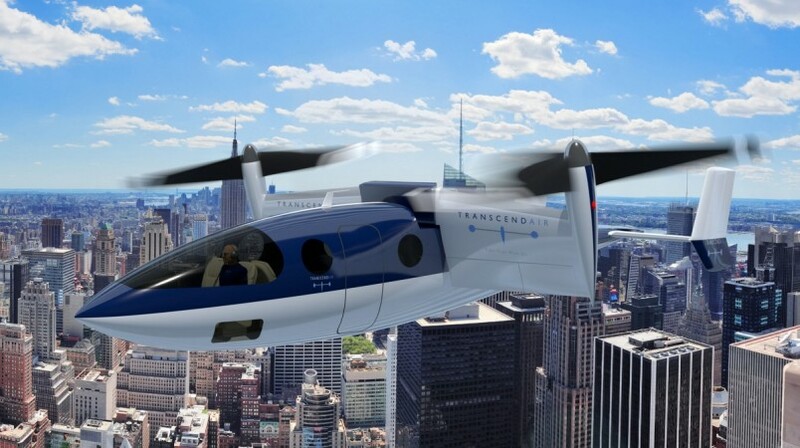 Transcend is led by CEO Gregory Bruell, co-founder of VTOL developer Elytron Aircraft, and Chief Operating Officer Peter Schmidt, who was president and CEO of air-taxi operator Linear Air. Other members of the team have previously worked for flying-car developer Terrafugia as well as NASA. Including VTOL aircraft designs developed by Elytron, Transcend says the team has built and flown 15 prototypes since 2009, mostly subscale models. The 14th is a 1/5th-scale model of the Vy 400 and the 15th is “coming soon,” says Transcend’s website. The Vy 400 has an all-composite airframe, pressurized to 8,000 ft., a dual-channel, triplex-redundant fly-by-wire system with envelope protection and a BRS Aerospace ballistic airframe recovery parachute. A Yasa electric motor powers a tail fan that provides balance and control in vertical flight. 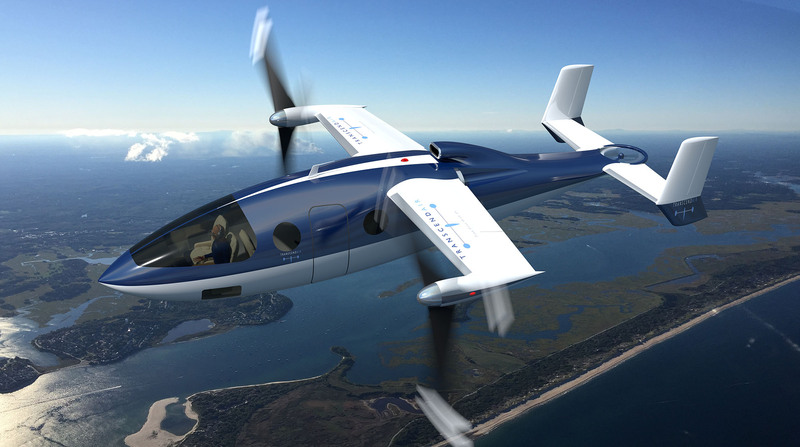 Vertical Aerospace operating out of Bristol, UK, aims to bring on demand, emissions-free intercity air taxi services to the UK skies within four years. The company has nailed the first step in its bold plan by building and flying a fully electric vertical take off and landing aircraft recently. Vertical Aerospace was founded by OVO Energy's Stephen Fitzpatrick in 2016, and now has a core of 28 engineers and technicians recruited from the ranks of Airbus, Boeing, Rolls-Royce, Martin Jet Pack, DarkTrace and General Electric. In the last 12 months, the company has put together a slick-looking full scale eVTOL demonstrator, secured test flight permission from the Civil Aviation Authority and got it airborne above Cotswold Airport in Kimble, Gloucestershire. Not too much has been revealed about the three-wheeled, battery-powered demonstrator, other than it weighs 750 kg (1,650 lb), has four three-blade rotors in a two-by-two configuration that lift it into the air and is currently reported capable of spending just 5 minutes aloft but can fly forward at up to 80 km/h (50 mph). However, the focus of rolling out the prototype was not range and speed, but to prove the full scale concept. With the first remotely-piloted flight in the bag, the company is already working with the European Aviation Safety Agency to have its next model granted Type Certification as part of a broader plan to get air taxi pilots flying electric VTOL aircraft on short hops by 2022. Meantime, Vertical Aerospace will continue to refine the technology to extend the range of the eVTOL, introduce autonomous aspects to the design and look to increase the services routes throughout the UK. Top speed of operational eVTOLs is expected to hover around the 200 mph (320 km/h) mark, with an initial range of between 100 and 140 miles (160 - 225 km) eventually inching up to make 500 miles per charge possible. Of course, Vertical Aerospace is not the only company looking into the viability of short-haul air taxis, with Rolls-Royce, Aston Martin and Transcend Air Corporation being among numerous firms currently looking into providing such services. So it looks like the skies in our very near future will be quite literally abuzz with activity. Almost 100 electrically propelled aircraft are in development worldwide, with more than half announced since 2017, according to a new analysis of the aircraft electrical propulsion field. What is more, assuming the surge of interest pans out, the implications for airports, airlines, lessors and manufacturers could be significant, consultants Roland Berger say in their latest report. “Electric propulsion is ushering in an age of innovation in aerospace and aviation of a type not seen for decades,” says Roland Berger Partner Robert Thomson. 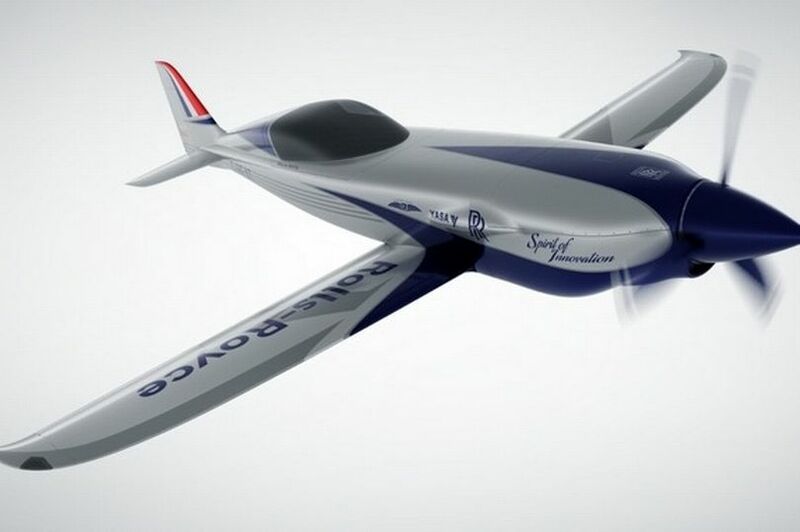 Released in July for the Farnborough Airshow, the new study by Thomson and coauthor Nikhil Sachdeva, a senior consultant at Roland Berger, comes amid a continuing stream of announcements in the field as both newcomers and legacy stalwarts ramp up electric aircraft efforts. On Aug. 2, Eviation Aircraft, which aims to be a global manufacturer of all-electric aircraft, announced its selection of Prescott, Arizona, as its U.S. headquarters. Weeks earlier, Boeing revealed it was setting up Boeing NeXt to focus its research on autonomous flight and advanced propulsion and to explore new transportation markets. During the air show, both Aston Martin and Rolls-Royce also unveiled flying-car concepts. Top-tier suppliers, as well, are making sure they are not left behind. United Technologies Aerospace Systems President Dave Gitlin said prior to the air show that he hoped his company would announce more about the startups it was working with. Still, about 60% of the roughly 100 projects worldwide are being conducted by startups and independents, according to Roland Berger. Aerospace incumbents are responsible for 30%, of which major OEMs are behind about half. The other 10% or so are by academic and government organizations, such as NASA, as well as major nonaerospace companies including Siemens and Kalashnikov Concern. Those figures underscore how interest from outside traditional aerospace and defense remains as strong, or stronger, than from inside industry. When Roland Berger first reported on the phenomenon late last year (counting just under 70 projects at the time), aerospace primes were responsible for only 18% of them, while other incumbents totalled 31%. Startups and independents at the time combined for 46%, while nonaero majors were 5%. Interest is being shown in other diverse ways, according to the latest update. Most electric aircraft are working toward general aviation (GA) or urban air mobility (UAM) taxi-like architectures, the consultants found, and the majority of development is occurring in traditional aerospace markets, namely Europe (45%) and the U.S. (40%). But there are notable efforts elsewhere, particularly Ehang’s electric vertical-takeoff-and landing (eVTOL) aircraft in China, Eviation’s regional aircraft in Israel and Brazil’s Embraer collaborating with Uber Elevate for an air taxi concept. Technologically, the majority of projects are all-electric with batteries as their only power source and targeted mainly at the GA and UAM markets. Larger developments targeting the regional and large commercial aircraft markets are mostly hybrid-electric and use traditional hydrocarbon-based fuels for greater power output and/or range extension, Roland Berger says. Most efforts currently are using propellers, with about one-third using ducted fans (see chart). While it is early for aircraft electric propulsion, the consultants already are eyeing possible ramifications for industry. For instance, currently the aircraft production sector is organized around airframers and engine-makers. But in an electric future, a third group could rival those: electric systems providers. “Certification will remain a crucial factor, and whatever balance of responsibilities are assigned by airworthiness authorities such as the FAA and EASA may ultimately determine where the power lies,” Thomson and Sachdeva say. Meanwhile, airports may be affected by having to build new infrastructure to accommodate UAM, and with their business less constrained—or protected—by anti-noise regulations, since electric aircraft will be quieter. Of course, changes will not occur overnight. Asked for predictions, Roland Berger’s panel of industry experts expects the first 50+ seat hybrid-electric aircraft to make a fare-paying London-Paris flight by 2032. But there will be milestones before then. According to Revolution.Aero, a media and event organizer targeting the UAM market, there are several publicly announced deadlines in coming years. They include Workhorse to begin delivering SureFly delivery drones by 2020 and Israel’s Urban Aeronautics to begin testing its CityHawk eVTOL in 2021. Uber has targeted 2023 for the commercial launch of its Uber Elevate scheme, and Transcend Air plans to launch a new city-to-city VTOL service in January 2024. NEW YORK – De Amerikaanse Transcend Air Corporation is gestart met de ontwikkeling een zespersoons tiltrotor. Deze Air Vy 400 moet vanaf 2024 commuter verbindingen gaan verzorgen tussen zakencentra in grote steden. De Vy 400 zal worden uitgerust met twee 1.700 pk sterke Pratt & Whitney PT6 turbopropmotoren waarmee kruissnelheden tot 405 mph (652 km/h) mogelijk moeten worden bij een vliegbereik van 450 mijl (725 km). Het ontwerp voorziet in de montage van een BRS ballistische reddingsparachute. 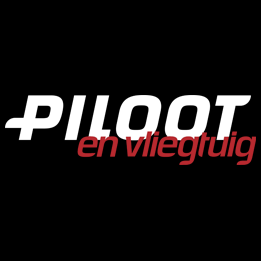 De titlrotor gaat leeg 2.177 kg wegen en krijgt een nuttige lading van bijna 1.000 kg. Transcend Air opent de orderboeken in 2020 en mikt naar eigen zeggen op het marktsegment waarin nu (VIP ingerichte) helikopters worden ingezet. 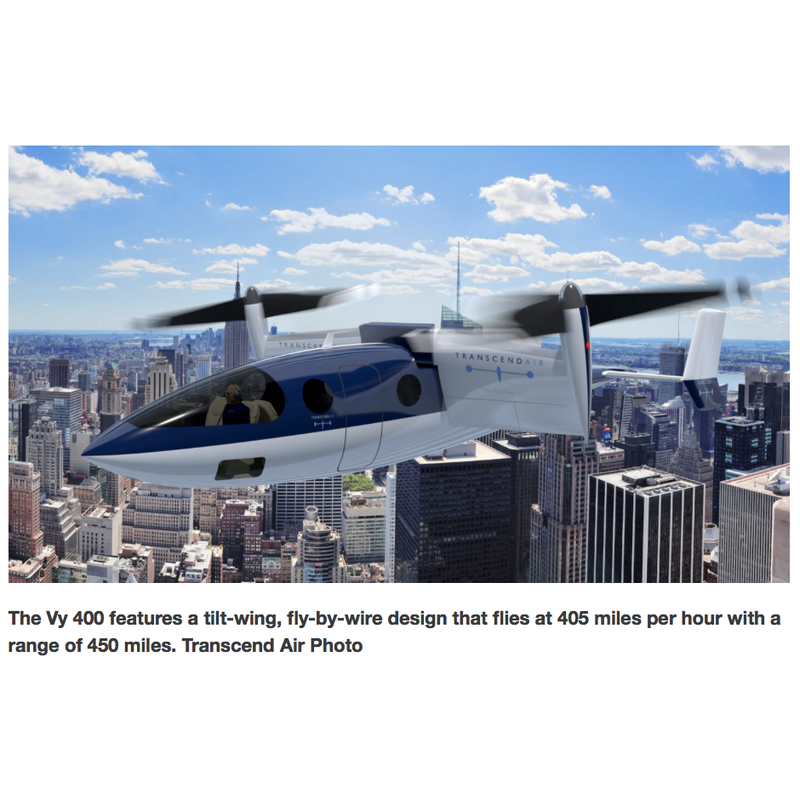 NEW YORK – De Amerikaanse Transcend Air Corporation is gestart met de ontwikkeling een zespersoons tiltrotor. Deze Air Vy 400 moet vanaf 2024 commuter verbindingen gaan verzorgen tussen zakencentra in grote steden. De Vy 400 zal worden uitgerust met twee 1.700 pk sterke Pratt & Whitney PT6 turbopropmotoren waarmee kruissnelheden tot 405 mph (652 km/h) mogelijk moeten worden bij een vliegbereik van 450 mijl (725 km). Het ontwerp voorziet in de montage van een BRS ballistische reddingsparachute. De titlrotor gaat leeg 2.177 kg wegen en krijgt een nuttige lading van bijna 1.000 kg. Transcend Air opent de orderboeken in 2020 en mikt naar eigen zeggen op het marktsegment waarin nu (VIP ingerichte) helikopters worden ingezet. Transcend Air Corporation anunció el desarrollo de un avión de seis asientos de despegue vertical y aterrizaje (VTOL) que espera revolucionar el mundo de la aviación. Se trata del Vy 400, el cual se espera esté listo para el año 2024,. Puede viajar a velocidades de 652 km/h, tres veces más rápido que un helicóptero tradicional, lo que significa que podrá viajar de Los Ángeles a San Francisco en tan solo 55 minutos. Tiene el sistema de navegación denominado fly-by-wire, no se podrá controlar manualmente, sino vía electrónica. 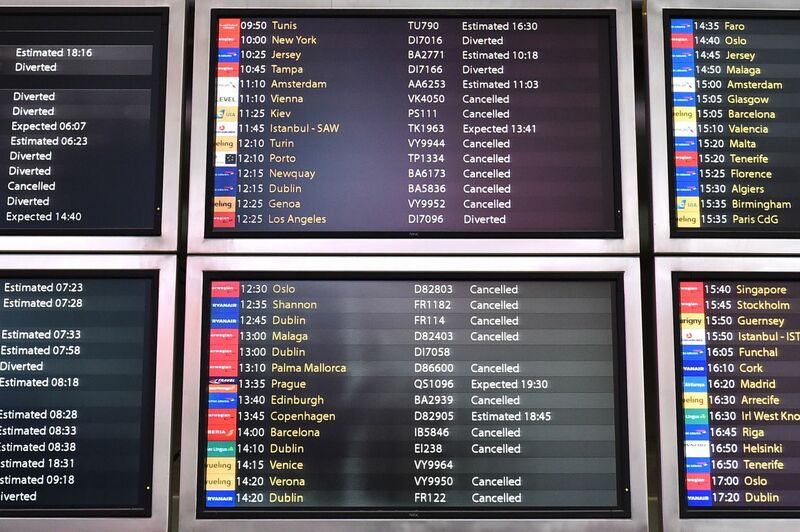 Sin embargo los vuelos no serán baratos: los viajes de de Nueva York a Boston, en 36 minutos, costarán 283 dólares, de Montreal a Toronto por 325 dólares en una hora, y de Los Ángeles a San Francisco por 315 dólares. Transcend Air Corporation anunció el desarrollo de un avión de seis asientos de despegue vertical y aterrizaje (VTOL) que espera revolucionar el mundo de la aviación. Se trata del Vy 400, el cual se espera esté listo para el año 2024,. Puede viajar a velocidades de 652 km/h, tres veces más rápido que un helicóptero tradicional, lo que significa que podrá viajar de Los Ángeles a San Francisco en tan solo 55 minutos. Tiene el sistema de navegación denominado fly-by-wire, no se podrá controlar manualmente, sino vía electrónica. Sin embargo los vuelos no serán baratos: los viajes de de Nueva York a Boston, en 36 minutos, costarán 283 dólares, de Montreal a Toronto por 325 dólares en una hora, y de Los Ángeles a San Francisco por 315 dólares. A flying taxi able to fly you at 405 mph was announced Thursday. The $3.5M Vy features a tilt-wing, fly-by-wire design that flies three times faster than traditional helicopters and has a range of 450 miles. It is claimed to make the journey form New York to Boston in just 36 minutes. Boston-based Transcend Air Corporation announced the development of the Vy 400, a six-seat, vertical take-off and landing (VTOL) aircraft, and the proposed launch of a new airline service that will deliver business travelers directly to and from major city centers. They explain: "The Vy will provide faster, more affordable door-to-door service than either helicopters or conventional airplanes, without the need for airports. Transcend will deliver service right from major city centers, such as Manhattan and downtown Boston, using VTOL-ready landing pads." Transcend Air Corporation says: "The lightweight, carbon-fiber Vy is the ultimate evolution of a fifty year old proven concept. The modern Vy will come with low operating costs and enhanced safety, by featuring novel advanced avionics and a whole-aircraft parachute that has already been in use for nearly twenty years." 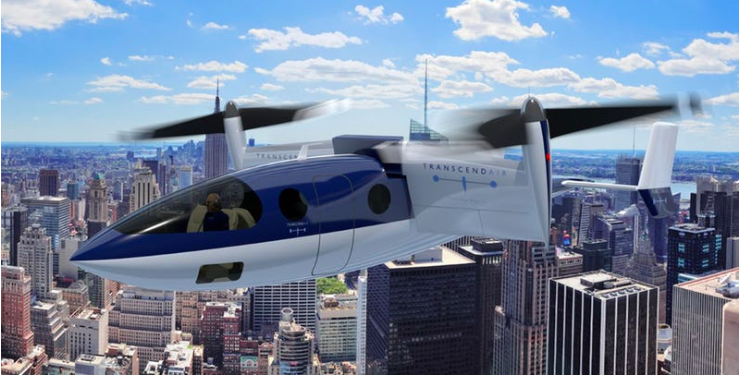 Transcend Air Corporation has announced that it has begun development on a six-seat vertical takeoff and landing (VTOL) concept designed to carry business travelers between major cities. The Transcend Air Vy 400 will be a piloted, turbine-powered model intended for four to five passengers. The company has also said it has plans to launch a commuter airline service in early 2024. “This is a necessary and transformative addition to city-to-city transportation options,” said Transcend CEO Greg Bruell. “It solves multiple problems at once: We’ll take cars off congested roads, reduce pollution around airports and lower the cost of air transportation while drastically reducing travel times.” According to Transcend Air, it has built and flown 15 prototype VTOL aircraft since 2009. The company says the tilt-wing Vy 400 will have a range of up to 450 miles and be able to cruise at 405 MPH. It will be powered by Pratt & Whitney PT6 engines and be equipped with a BRS whole-aircraft parachute. The expected useful load for the aircraft is 2,200 pounds. The aircraft weighs 4,800 pounds empty and can carry 960 pounds of fuel. According to the company website, a Vy trip from New York to Boston would take 36 minutes and cost $283 per seat. Transcend Air plans to open the order book for the aircraft in late 2020 at a price of $3.5 million. Transcend Air Corporation has announced that it has begun development on a six-seat vertical takeoff and landing (VTOL) concept designed to carry business travelers between major cities. The Transcend Air Vy 400 will be a piloted, turbine-powered model intended for four to five passengers. The company has also said it has plans to launch a commuter airline service in early 2024. “This is a necessary and transformative addition to city-to-city transportation options,” said Transcend CEO Greg Bruell. “It solves multiple problems at once: We’ll take cars off congested roads, reduce pollution around airports and lower the cost of air transportation while drastically reducing travel times.” According to Transcend Air, it has built and flown 15 prototype VTOL aircraft since 2009. The company says the tilt-wing Vy 400 will have a range of up to 450 miles and be able to cruise at 405 MPH. It will be powered by Pratt & Whitney PT6 engines and be equipped with a BRS whole-aircraft parachute. The expected useful load for the aircraft is 2,200 pounds. The aircraft weighs 4,800 pounds empty and can carry 960 pounds of fuel. According to the company website, a Vy trip from New York to Boston would take 36 minutes and cost $283 per seat. Transcend Air plans to open the order book for the aircraft in late 2020 at a price of $3.5 million. Boston-based Transcend Air Corporation announced that it has begun development on a six-seat vertical takeoff and landing (VTOL) concept designed to carry business travelers between major cities. Boston-based Transcend Air Corporation announced that it has begun development on a six-seat vertical takeoff and landing (VTOL) concept designed to carry business travelers between major cities. The Transcend Air Vy 400 will be a piloted, turbine-powered model intended for four to five passengers. The company has also said it has plans to launch a commuter airline service in early 2024. According to the company website, a Vy trip from New York to Boston would take 36 minutes and cost $283 per seat. Transcend Air plans to open the order book for the aircraft in late 2020 at a price of $3.5 million. 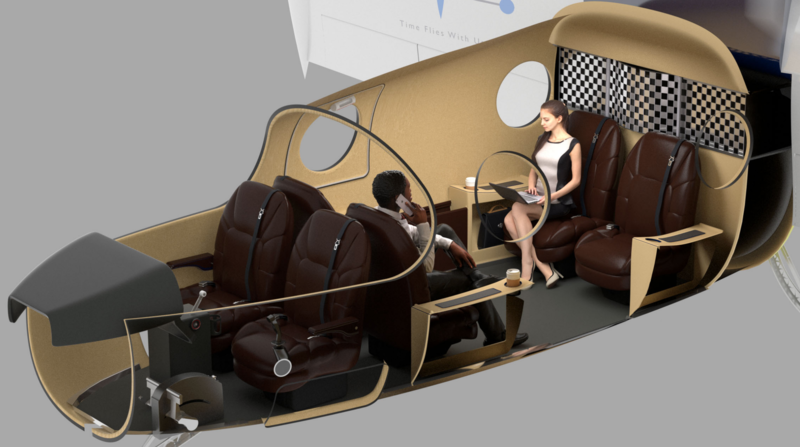 Transcend Air has developed Vy, a tilt-wing vertical take-off and landing six-seat aircraft designed to deliver travelers directly to and from major cities. Transcend Air aims to provide passengers with 36-minute-long trips from New York to Boston for USD283. دانش > فناوری - کمپانی Transcend Air Corporation محصولی را معرفی کرد که می‌تواند مثل بالگرد نشست‌وبرخاست کند، درحالی‌که یک هواپیما است. قرار است سفرهای تجاری عمده برای تُجّار از این طریق بین شهرهای عمده (شامل بوستون تا نیویورک) صورت گیرد و سرعت تعریف‌شده برای آن 651 کیلومتر بر ساعت تعریف‌شده که 3 برابر سرعت بالگردهای فعلی است و می‌تواند 450 مایل را طی کند. «گریک بروئل» مدیر اجرایی کمپانی می‌گوید: این پرنده فوق مدرن می‌تواند بین لس‌آنجلس تا سان‌فرانسیسکو را 55 دقیقه‌ای طی کند. به گفته وی هنگام پرواز از سیستم نویگیشن موسوم به Fly-By-Wire استفاده می‌شود که به‌صورت خودکار(و نه دستی) مدیریت می‌شود. VTOL از فیبر کربن و بسیار سبک طراحی‌شده و در هزینه‌های سفر و همچنین زمان سفر صرفه‌جویی چشم‌گیری دارد. مشتریان با پرداخت 283 دلار در عرض 36 دقیقه می‌توانند از نیویورک تا بوستون را با VTOL پرواز کنند. همچنین هزینه مونترال تا تورنتو 325 دلار در یک ساعت و هزینه سفر بین لس‌آنجلس تا سان‌فرانسیسکو نیز 315 دلار خواهد بود. People can even buy VTOL aircraft from Transcend at a price of about $3.5m by 2024, says the company. Transcend Air, a US-based aviation company is now building a tilt-rotor aircraft that they believe can make travelling domestically faster and a lot cheaper than flying. Tilt-rotor is a vertical take-off and landing (VTOL) technology that has a vehicle take off like a helicopter from a helipad and land on one, but while in flight, it moves and behaves like an aeroplane. It is called tilt-rotor because the rotors are horizontal when taking off and landing, but turn vertical when flying forward. The US Air Force (USAF) already have a tilt-rotor vehicle called the V-22Osprey built by Bell and Boeing which was fielded in 2009. Transcend Air want to make a smaller, more comfortable, civilian version of it to use between cities, carrying about four to five passengers at a time. Transcend wants to start service by 2024, and they claim that ticket prices are likely to be cheaper than traditional airline prices. Tickets are priced between $283 and $325. The company's site has three routes in mind as of now- New York City to Boston, which they say will take about 36 minutes, Los Angeles to San Francisco 55 minutes and Montreal to Toronto at 60 minutes. The aircraft is claimed to have a cruising speed of over 650 kmh, which is much faster than the Osprey which can reach a maximum of 565 kmh. The company is also selling their aircraft at a price of about $3.5m, for those interested in buying their own VTOL aircraft. Transcend claims that their air taxi service will be a lot more sustainable and support the increasing need for air travel without having to build new airports by making use of existing infrastructure. After service starts, the company has identified 46 city centre pairs in the US where they claim that their service can be faster and less expensive than existing platforms. Ostatnio panuje jakiś istny szał na podniebne taksówki. Zapowiada się, że nadchodząca dekada w lotnictwie będzie należała do maszyn typu VTOL, które zapewnią szybkie i tanie podróże. Amerykańska firma Transcend Air Corporation zaprezentowała właśnie swoją wizję podniebnej taksówki o nazwie Vy. Ma ona rozpocząć regularne loty pomiędzy największymi amerykańskimi metropoliami już w 2024 roku. Maszyna typu VTOL może startować i lądować praktycznie z małego trawnika, dzięki czemu może dostarczać i odbierać pasażerów nawet ze ścisłych centrów miast. Na swój pokład może zabrać 4-5 pasażerów i rozpędzić się w powietrzu do 650 km/h, a to wszystko w trybie autonomicznym. Pasażerowie będą musieli tylko kliknąć na mapie miejsce, do którego chcą się udać. Podniebna taksówka typu VTOL od Transcend Air. Fot. Transcend Air Corporation. Firma Transcend Air Corporation twierdzi, że takie maszyny to przyszłość, a ich wynalazek będzie najbardziej zaawansowaną podniebną taksówką na świecie. Przewaga Vy nad helikopterami i podobnymi maszynami sprowadza się do liczby mogących wejść na pokład pasażerów i prędkości przelotów, która jest nawet 3 razy większa. Firma oferuje też wysoki poziom bezpieczeństwa. Ma go zapewnić specjalny spadochron zainstalowany w górnej części maszyny. W przypadku awarii, pozwoli on bezpiecznie sprowadzić Vy na ziemię. Transcend Air chce rozpocząć testy swojej podniebnej taksówki już za 2 lata. Co ciekawe, maszynę będzie można kupić na własność za "jedyne" 3,5 miliona dolarów lub płacić tylko za przeloty. Ceny wydają się rozsądne, bo za 35-minutowy przelot z Nowego Jorku do Bostonu zapłacimy 283 dolarów, 55-minutowy z Los Angeles do San Francisco już 315 dolarów, a 60-minutowy z Montrealu do Toronto nie więcej niż 325 dolarów. The Transcend Air Vy 400 is a tilt-wing eVTOL aircraft that is designed for efficient city-to-city transportation. The company plans to operate the six-passenger electric VTOL aircraft between major city centers, such as Boston and New York, at half the price of a commuter helicopter. Transcend Air says it plans to get the service off the ground in early 2024 and has already begun taking orders for the futuristic Vy 400. The Transcend Air Vy 400 is based on the Elytron Converticopter — the CEO of Transcend Aero, Gregory Bruell, was a co-founder of the Elytron (turboshaft-powered) VTOL. It’s the age of hyperloops and high-speed connectors, and the future of travelling has further been cushioned with less hours and efficient services. The aerospace luminaries at Transcend Air Corporation have developed the Vy 400, which will revolutionise flying and make it a door-to-door activity, soon. Transcend Air Corporation aims to transform transportation facilities by 2024 with their new aircraft. The Corporation’s aircraft boasts of the vertical take-off and landing (VTOL) highlight and has six seats behind the cockpit. A balancing act between helicopters and planes, the aircraft seeks to eliminate the need for airports by providing an affordable service directly to and from major city centres. The lightweight, carbon-fibre aircraft credits itself with a range of 450 miles, and features a tilt-wing, fly-by-wire design, which works at a speed three times faster than the usual helicopter. Reducing the travel time between Los Angeles and San Francisco to under an hour, the Vy eyes for enhanced productivity and substantially low operating cost. With the development of VTOL air pads on major business centres across the globe, the aircraft envisions to transform travelling to a truly convenient experience. All potential passengers are requested to put on their seat belts as the airline will be ready for a vertical take-off from early 2024. The Transcend Air Corporation has announced the development of the Vy, a tilt-wing vertical take-off and landing (VTOL) six-seater aircraft designed to ferry people in and out of cities. Simultaneously, the company has said it will launch an air taxi-style commuter service to operate the aircraft, which it hopes to have up in the air in 2024. The Vy pivots from an aircraft capable of helicopter-style take off and landing (albeit with two main overhead rotors rather than one) to one capable of cruising at 405 mph (652 km/h) by virtue of its tilt-wing design. Essentially, by rotating its wings those take off and landing rotors become outsized propellers in "airplane mode." The company claims this is three times faster than traditional helicopters, though that's only really true if you pick a traditional helicopter of one third the speed. But, multiples aside, 405 mph is much faster than a helicopter. Let's just move on. Just how likely this all is to happen remains to be seen. 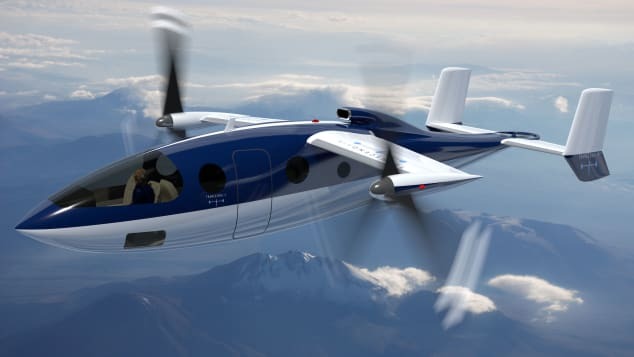 The Transcend Air Corporation has apparently spun out of the now "wound down" Elytron Aircraft, responsible for the similar 2S tilt-rotor concept we saw back in 2015. So far as we can tell, the only instance of one of these taking to the air was accidental. Confusingly, Elytron has also forked into the VTOL Aerospace company, which has achieved flight with its CVC 96 prototype, albeit at downsized UAV scale. Operating in the VTOL space has its ups and downs, apparently. The trips will use existing helipads, so at least there are no major infrastructure impediments to the company's plans. And, if you're feeling brazen, from 2020 you'll be able to order your own Vy for a mere $3.5 million. Whether the company will meet its targets remains to be seen, but you have to admire the pluck. Unul dintre lucrurile care mi-au plăcut cel mai mult la filmele SF erau mașinile zburătoare și când eram mic speram ca pe vremea asta să avem deja nave pe cer. Totuși, omenirea încă se chinuie cu mașinile tradiționale, dar există speranțe. Transcend Air Corporation a anunțat că lucrează la o aeronavă numită Vy 400 ce are șase locuri cu care ai putea să zbori prin oraș, dar și să faci un drum până la munte sau la mare în doar câteva minute. Aeronava ar putea decola și ateriza exact ca un elicopter și este capabilă să ajungă până la o viteză de 652 km/h. Datorită acestui mod de funcționare pentru acest vehicul nu va fi nevoie de un aeroport, ci se vor folosi heliporturi. Unul dintre lucrurile care mi-au plăcut cel mai mult la filmele SF erau mașinile zburătoare și când eram mic speram ca pe vremea asta să avem deja nave pe cer. Totuși, omenirea încă se chinuie cu mașinile tradiționale, dar există speranțe. Transcend Air Corporation a anunțat că lucrează la o aeronavă numită Vy 400 ce are șase locuri cu care ai putea să zbori prin oraș, dar și să faci un drum până la munte sau la mare în doar câteva minute. Aeronava ar putea decola și ateriza exact ca un elicopter și este capabilă să ajungă până la o viteză de 652 km/h. Datorită acestui mod de funcționare pentru acest vehicul nu va fi nevoie de un aeroport, ci se vor folosi heliporturi. Transcend Air Corporation has announced the development of the Vy 400 (Vy), a six-seat, vertical take-off and landing (VTOL) aircraft, as well as the proposed launch of a new airline service that will deliver business travelers directly to and from major city centers. The lightweight, carbon-fiber Vy is the ultimate evolution of a 50-year-old proven concept. The modern Vy will come with low operating costs and enhanced safety, by featuring novel advanced avionics and a whole-aircraft parachute that has already been in use for nearly 20 years. * Transcend Air is not yet a certificated air carrier, and the "Buy Ticket" is for illustrative purposes only.